Jeune Asphyxiating Thoracic Dystrophy (JATD; sometimes called Jeune syndrome) is a member of a group of conditions called short rib-polydactyly syndromes. These conditions are characterized by specific types of bone malformations. Patients typically have a narrow thorax (chest) and extra fingers and/or toes (polydactyly). Other members of this group include Ellis-van Creveld syndrome and a number of disorders collective called short rib-polydactyly syndrome (SRPS). There are 4 types of this syndrome and they are generally lethal in the prenatal period. They are: Saldino-Noonan syndrome (type 1), Majewski syndrome (type 2), Verma-Naumoff syndrome (type 3) and Beemer-Langer syndrome (Type 4). Types 1 and 3 are considered to be the same syndrome (see Differential Diagnosis, below). Affected individuals often have narrow chests with short ribs and visceral malformations. Specific malformations differ between the syndromes. The conditions described in the previous paragraph are also described as ciliopathies because they affect small structures called cilia. Cilia are hairlike structures and are found on almost all mammalian cells. They have important roles in development and in common body functions. For example, cilia help push eggs down the Fallopian tubes, and they help clean microbes and particles out of air passages, including the lungs. When they stop functioning properly, diseases such as bronchitis can result. Smoking can damage cilia. The relationship between JATD and the mutated cilia gene associated with it is not currently understood. However, in a developing embryo, abnormal cilia or their absence can cause problems including extra fingers or toes, blindness, lung abnormaltiies, aand brain abnormalities, including intellectual disabilities. This wide range of problems occurs because cilia have many roles in signaling during embryonic development (for review, see reference 1). JATD is a very rare disease. It occurs in roughly 1 person in 100,000-130,000 (2,3). Males and females are equally affected, as are members of different races and ethnic groups. This condition is characterized by skeletal abnormalities, especially in the ribs and hips. The defining problem in this condition is a very narrow thorax/chest with short ribs. In many patients, this abnormality is severe enough to cause respiratory problems, which can worsen if poor rib cage growth restricts lung growth. Multiple surgeries may be required to correct this problem. Unsurprisingly, many JATD patients require supplemental oxygen. The photo at the right shows an x-ray of an infant with Jeune syndrome. The x-ray shows that the infant has a bell-shaped chest, which is a very common (though not universal) finding in this condition. Bell-shaped chests are evident in the photo below on the right, and in photos M and H in the large panel at the bottom of this page. The patient in photos I and L does not have a bell-shaped chest. A number of non-musculoskeletal problems also occur in JATD. They include frequent respiratory infections, and most notably, liver and/or kidney disease. As noted above, renal problems were the leading cause of death in JATD patients aged 3-10 years in an analysis of 126 cases. Thus, clinicians may wish to monitory liver and kidney function in JATD patients. In addition, retinal abnormalities appear to occur in half of all JATD patients (particularly after age five; see references 6,7). Intelligence is not generally affected, and JATD patients do not share a common facial appearance. JATD is an autosomal recessive disease caused by mutations in the genes IFT80, IFT140, TTC21B, WDR19, and DYNC2H1. The term autosomal recessive means that the syndrome is passed on when both parents contribute a copy of the same mutated gene to their child. Diagnosis is usually based on clinical findings and radiography, but it can be confirmed by testing for mutations in genes noted above. Reference 3 has a discussion of diagnostic criteria in JATD. Because this condition is commonly known by two names (Jeune syndrome and Jeune asphyxiating thoracic dystrophy), there are two testing links in the Testing section at the right. In general, the skeletal abnormalities in JATD are distinctive and generally consistent. 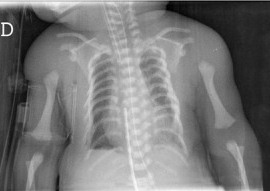 As a result, x-ray findings can distinguish it from other disorders involving skeletal dysplasia. However, Ellis van Creveld syndrome has many similarities with JATD. For example, pelvic abnormalities are very similar (4). However, the chest in EvC syndrome is not a severely affected as it is in JATD. In addition, individuals with EvC syndrome are frequently born with heart defects, and kidney failure is not a feature of this syndrome (4). JATD patients also do not have the dental abnormalities seen in EvC syndrome. The four syndromes included in the diagnosis of short rib-polydactyly syndrome are also included in the differential diagnosis of JATD (see list at top of page). These conditions are generally lethal prenatally or in the neonatal period. Saldino-Noonan syndrome and Verma-Naumoff syndrome are now considered to be the same (see OMIM entry). They are characterized by a swollen appearance, postaxial polydactyly (the extra finger or toe is toward the outside of the hand or foot), very short limbs, and metaphyseal dysplasia of the tubular bones. Pelvic abnormalities resemble EvC syndrome and JATD. The genitalia in males are also affected. Abnormalities of the nails (including absent nails) may also be present. This condition is autosomal recessive, and is caused by mutations in DYNC2H1, the same gene associated with JATD. It may be considered to be a more severe form of JATD. Majewski syndrome patients have short ribs and limbs, may have a cleft lip, polydactyly, syndactyly, and abnormalities of the genitalia. They may also have abnormalities of the epiglottis and viscera, including the kidneys. Death is usually prenatal or perinatal. Majewski syndrome is autosomal recessive and is caused by mutations in the gene NEK1. 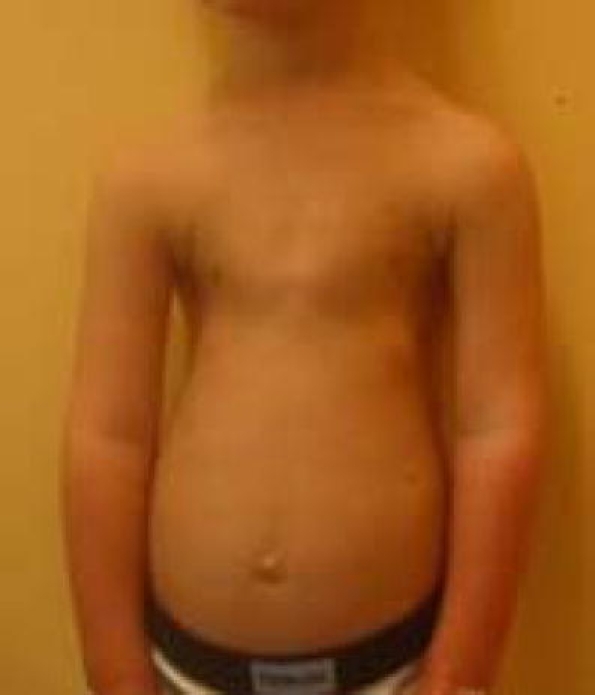 Beemer-Langer syndrome is characterized by severe swelling the fetus or newborn, a narrow chest with short ribs, and short limbs that may be bowed. Polydacytly occurs in this condition, but it is rarer than it is in Saldino-Noonan/Verma-Naumoff syndrome. To date, no gene has been associated with Beemer-Langer syndrome, but researchers have excluded DYNC2H1 and NEK1. 1. Lee JG & Gleeson JG (2011) A systems-biology approach to understanding the ciliopathy disorders. Genome Med 3:59. Full text on PubMed. 2. Oberklaid F et al. (1977) Asphyxiating thoracic dysplasia. Clinical, radiological, and pathological information on 10 patients. Arch Dis Child 52(10):758-765. Full text on PubMed. 3. Keppler-Norueil KM et al. (2011) Late respiratory failure in Jeune syndrome. Clinical insights gained from eight new cases and review of reported cases with Jeune syndrome (asphyxiating thoracic dystrophy). Am J Med Genet Part A 155:1021-1032. Abstract on PubMed. 4. de Vries J et al. (2010) Jeune syndrome: description of 13 cases and a proposal for follow-up protocol. Eur J Pediatr 169:77-78. Full text on PubMed. 5. Leroy P et al. (2010) Late respiratory failure in Jeune syndrome. Eur J Pediatr 169:375-376. Full text on PubMed. 6. Baujat G et al. (2013) Asphyxiating thoracic dysplasia: clinical and molecular review of 39 families. J Med Genet 50:91-98. Abstract on PubMed. 7. Wilson DJ et al. (1987) Retinal dystrophy in Jeune's syndrome. Arch Ophthalmol 105(5):651-657. Abstract on PubMed. 8. Shaheen R et al. (2014) A founder CEP120 mutation in Jeune asphyxiating thoracic dystrophy expands the role of centriolar proteins in skeletal ciliopathies. Hum Mol Genet 24(5):1410-1419. Full text on PubMed. 9. Drera B et al. (2014) A case of neonatal Jeune syndrome expanding the phenotype. Clin Case Rep 2(4):156-158. Full text on PubMed. 10. Miller KA et al. (2013) Cauli: a mouse strain with an ift140 mutation that results in a skeletal ciliopathy modelling Jeune syndrome. PLoS Genetics 9(8):e1003746. doi: 10.1371/journal.pgen.1003746 Full text on PubMed. JATD overview: Seattle Children's Hosp. Above: A child with JATD and a bell-shaped thorax. See reference 4.
from the original publication, click here. See reference 8.
short ribs, underdeveloped lungs, and handlebar clavicles. See reference 9. Below: An x-ray of the abdominal area and upper limbs in the same patient. Note the extra fingers on each hand and the trident acetabulum bones. See reference 9.
for age (E). H, humerus; T, tarsus. See reference 10.